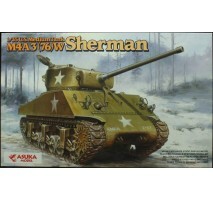 Plastic model kit of the U.S. M4A3(76)W ShermanScale - 1:35Workable suspensionVery highly detailed modelIncludes photo etch set 3 decal options :• C Company, 69th Tank Battalion, 6th Armored Division 1944-45,• C Company, 761st Tank Battalion, Nancy, .. 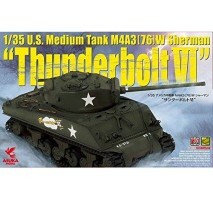 Plastic model kit of the U.S. 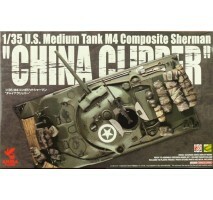 Medium Tank M4 Sherman Composite "CHINA CLIPPER"Scale - 1:35Workable suspensionVery highly detailed modelIncludes resin stowage accessories by Value Gear!Available in stock in late April 2017.. 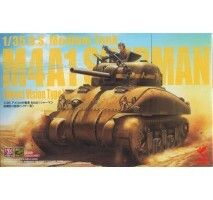 Plastic model kit of the U.S. Medium Tank M4A1 Sherman Direct Vision TypeScale - 1:35Workable suspension - VVSS early typeVery highly detailed modelIncludes photo etch set and decal options for 4 vehicles by CartografThis kit does not contain paint, .. 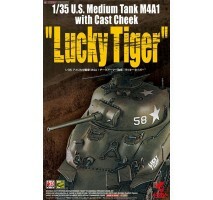 Plastic model kit of the M4A1 Sherman "Lucky Tiger"Scale - 1:35Workable suspensionVery highly detailed modelCommander figure included + accessoriesAvailable in stock in late April 2017.. 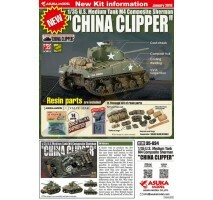 Plastic model kit of the U.S. Medium Tank M4A3 (76) W Sherman "Thunderbolt VI"Scale - 1:35Workable suspensionVery highly detailed modelIncludes photo etch set and one decal option by CartografAvailable in stock in late April 2017..